Attention dog lovers! Read up on heroic dogs in this heart-touching collection of the bravest canines ever. Readers get three books telling the tales of soldiers in Afghanistan befriending and adopting the dogs of war to a brave bloodhound tracking down criminals in the states. This eBook collection delivers hours of great storytelling. For fans of Gone With the Wind on the 75th anniversary of the classic film, this three-volume eBook Collection pulls together two bestselling biographies, one of author Margaret Mitchell and one of film star Vivien Leigh, and combines them with The Complete Gone with the Wind Trivia Book to give readers a deep insight into the lives of those who created this timeless masterpiece. This three-in-one holiday gift set is the perfect gift for any baseball fan this season. Each with its own unique story, these books will thrill any fan of America’s favorite pastime.. 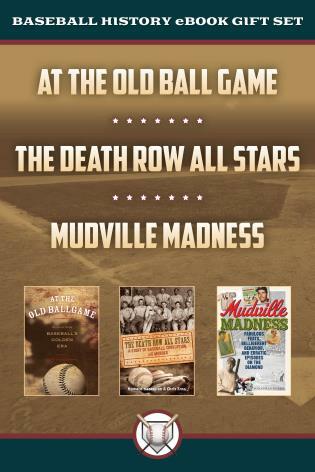 The set includes class tales (At the Old Ballgame: Stories From Baseball’s Golden Era), scandals (Mudville Madness: Fabulous Feats, Belligerent Behavior, and Erratic Episodes on the Diamond), and a unique portrait of baseball’s early days (Death Row All Stars: A Story of Baseball, Corruption, and Murder). That’s three strikes for this set! Get your fix of not one, not two, but three of the Woods Cop Mystery series! This triple-thrill pack includes three of Joseph Heywood’s mystery novels: Ice Hunter, Blue Wolf in Green Fire, and Chasing a Blond Moon. Each novel takes the reader on a suspenseful journey through the wild against vicious poachers and hunters. This package is the perfect introduction to this thrilling mystery series featuring conservation officers in Michigan’s Upper Peninsula. Give the gift of baseball this season with this eBook bundle. The Yankees fan eBook set includes Babe Ruth’s Called Shot, the Yankees Fan Little Book of Wisdom, and Red Sox vs. Yankees. Each book explores the history and sport of the team, its rivals, and its most famous athletes. This set is the perfect gift for any and all Yankee fans! Matt Harvey is getting healthy. The young pitching staff looks ready from prime time. Even Mr. Met is holding his head a little higher these days. This eBook Gift Set is the just the thing for Mets fans this holiday season. Each book highlights only the best of the Mets throughout baseball history. This set includes Amazing Mets Trivia, Mets Fan’s Little Book of Wisdom, and Best Mets. From trivia to tips and best-kept secrets, these books are fast paced and exciting: each a must-have for any true Mets fan. This package is any history-buff’s dream holiday present. W. C. Jameson’s exploration of outlaws and criminals from the 20th century goes deep within the wrinkles of time, uncovering long-kept secrets, misinformed facts, and what became of these outlaws in the end. The set includes Butch Cassidy, John Wilkes Booth, and Billy the Kid. Give the gift of history and conspiracy this holiday season.